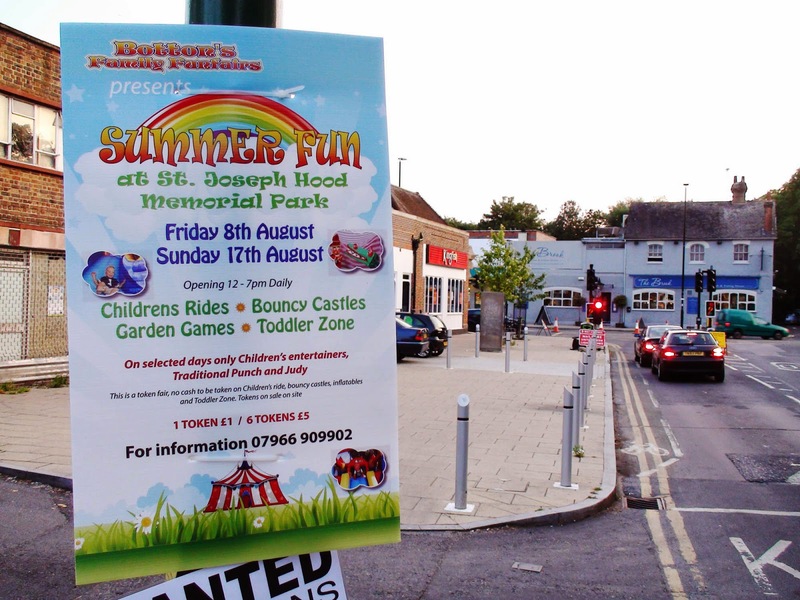 As of Tomorrow, Botton's Family Funfairs will be putting on a Summer Fair in St. Joseph Hood Memorial Park which is that park just beyond the horse fields if you go walking up past Green Lane School and turn left towards Motspur Park. The fair which is aimed squarely at children between the ages of 2 and 12 will on from tomorrow (Friday 8th August) until next Sunday 17th August - each day from midday until 7pm. Botton's Family Funfairs (as the name somewhat implies) is a family run business that puts on funfairs. It is free to turn up and there will be entertainment including performers and swingball for free. Other attractions cost money in the form of tokens which can be bought for a pound each or 6 of them for £5. Rides and attractions cost from 1 token to 4 tokens with the most expensive ride being the bungee trampoline at 4 tokens. The bouncy castle is 1 token and there is an all new extra special bouncy castle with a ridable leopard's head (no I'm not quite sure either) which is 3 tokens.